Even from photos and post card renderings, heavy and imposing. I doubt it looked less so in person. Maybe in a different location. You know, just take a look at the SCALE of the keystone over the large arched opening on the right as well as the Corinthian capitols in comparison to the height of the people seen in the photo! That keystone as I remember had a carved Roman styled figure on it's front, it must have almost been life sized 5-6' tall and like the rest- carved stone! The Manhattan Hotel was designed by Henry Hardenbergh and was 250 feet tall and 16-1/2 stories. The Coogan Building (formerly the Racquet Club Building) was designed by A.H. Thorpe in 1875-76. There's a photo in the book Rise of the New York Skyscraper 1865-1913. From the photo, it looks like the building was 5 or 6 stories, constructed of brick, with arched windows. There's a very good photo of the City Hall Post Office (designed by A.B. Mullett) in relation to its surroundings in New York 1900. The New York Tribune Building was designed by Richard Morris Hunt and was 260 feet tall. There's a good photo in Rise of the New York Skyscraper and several pages of information. The Hanover National Bank Building was designed by James B. Baker in 1901-3 and was 22 stories. There's a photo in Rise of the New York Skyscraper. It was located next door to the Banker's Trust Building on Nassau Street. If you stop to think about it, these fantastic old and long-gone masterpieces are not truly gone. They are simply not rebuilt. If anyone WANTED to recreate any of these gems, I am sure they could be, and I'm sure they could be designed in such a way to make them practical, cost-efficient, profitable, and energy-efficient. In other words, once a building has been designed; i.e., placed on paper or computer as derived from the minds of people, it continues to exist. Whether we choose to produce what has been developed already is simply up to us. For example, if somebody wanted to make a grown-up modern version of the Singer Building, all they'd have to do is take the original design, scale it to contemporary standards or height, and build it. After all, there are Frank Lloyd Wright buildings that only NOW are being built! A WELL-KNOWN TOWER The Singer Building as it looked when demolition began in 1967, with a wall decoration in the lobby that used needle and thread imagery. The building was one of several designed by the visionary architect Ernest Flagg for Frederick Bourne. The 41-story Singer Building, the tallest in the world in 1908 when it was completed at Broadway and Liberty Street, was until Sept. 11, 2001, the tallest structure ever to be demolished. 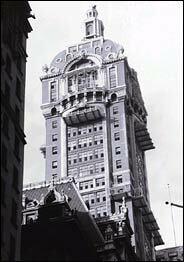 The building, an elegant Beaux-Arts tower, was one of the most painful losses of the early preservation movement when it was razed in 1967. A Manhattan reader, Robert Bittencourt, wondered why such an iconic building was removed from the city's streetscape. The answer: size matters. The building was the result of an unusual patron-architect partnership between Frederick Bourne, the head of the Singer Sewing Machine Company, and Ernest Flagg, a visionary architect who at first opposed skyscrapers. Around 1880, Bourne was an industrious clerk in the Mercantile Library when he somehow earned the admiration of Alfred Corning Clark, the son of Edward Clark. The elder Clark was at the time the head of Singer, and was also starting to build his Dakota apartment house at 72nd Street and Central Park West. Bourne began working for the Clarks - indeed, a 1905 account in The New York Press said that Bourne had directed the construction of the Dakota. Bourne was soon brought into the Singer company, which was selling 500,000 sewing machines a year; he became its president in 1889. In 1896, Bourne hired the Paris-trained Flagg, an early exponent of the Beaux-Arts style, to design a new Singer headquarters at Broadway and Liberty Street. Flagg's original red brick and stone structure, with its mansard roof, was an assured but not remarkable Paris-style building. In 1902 Bourne had Flagg design a loft building for the company at 561 Broadway, near Prince Street - an ingenious and sophisticated mix of frankly exposed structural terra cotta, steel and ironwork, with whimsical red and green coloring. In the same year, Bourne began acquiring additional land for a far more important architectural commission for Flagg: what was to be the tallest building in New York. In the 1890's, Flagg had denounced the growing crop of skyscrapers, and by the turn of the 20th century he was horrified by the darkened streets and raw side walls produced by such buildings. But in the rough and tumble of New York real estate, the opinions of a Paris-trained architect had low priority, and Flagg shifted his focus to reforming skyscraper design. The earliest tall buildings had risen directly from the edges of their plots, presenting bulky fronts and unattractive rears. In a 1907 article in The Times, Flagg lamented the resulting "wild-Western appearance." He urged that skyscraper towers more than 10 or 15 stories high should be set back from the property lines, so that the tower occupied only one-quarter of the lot. All four sides could then be treated architecturally, and "we should soon have a city of towers instead of a city of dismal ravines," as Flagg put it in the article. His proposal also envisioned the concept of transferring air rights from adjacent owners. Begun in 1906, the Singer Building incorporated Flagg's model for "a city of towers," with the 1896 structure reconstructed as the base, and a 65-foot-square shaft rising 612 feet high, culminating in a bulbous mansard and giant lantern at the peak. Flagg reused the earlier building's French-style color scheme of bright red brick and light stone and terra cotta, framing a broad, iron-framed bay of windows rising most of the height of the tower. The lobby had the quality of "celestial radiance" seen in world's-fair and exposition architecture of the period, as the author Mardges Bacon described it in her 1986 monograph "Ernest Flagg" (Architectural History Foundation, MIT Press). A forest of marble columns rose high to a series of multiple small domes of delicate plasterwork, and Flagg trimmed the columns with bronze beading. A series of large bronze medallions placed at the top of the columns were alternately rendered in the monogram of the Singer company and, quite inventively, as a huge needle, thread and bobbin. Singer kept its offices high in the tower, and the bulbous top became one of New York's best known landmarks, even though it was superseded by the 700-foot-tall Metropolitan Life Tower on East 23rd Street in 1909. Flagg's vision of a city of free-standing towers did not get much traction. By the time the Singer Building was completed, another structure, the 34-story City Investing Building, ran plum up against the north side of the Singer plot. Flagg soon became an advocate for skyscraper legislation. The 1916 city zoning law incorporated some of the ideas he had proposed, but it favored the more familiar design of staggered setbacks. Bourne worked with Flagg to produce several other striking commissions, like Bourne's suave country house, Indian Neck Hall, in Oakdale on Long Island, and his retreat in the Thousand Islands, the brooding, Wagnerian "Towers." And Bourne brought Flagg to the Pomfret School in northeastern Connecticut, where the architect designed a moody Norman-style chapel, a crisp Beaux-Arts main schoolhouse and a long ridge-top row of brick dormitories, one of which was named after Bourne, whose son attended the school. When Bourne died in 1919, he left an estate of $25 million. In 1961, the Singer company announced plans to sell Bourne's monument and move to Midtown. William Zeckendorf, chairman of the development firm Webb &amp; Knapp, bought the Singer tower and the rest of the block, hoping to get the New York Stock Exchange to relocate there. That project failed, but United States Steel bought the Singer Building block in 1964 for what became the 54-story One Liberty Plaza, 743 feet high. Demolition of Flagg's building began in August of 1967, as the World Trade Center was rising to the west. In his 1963 inventory "New York Landmarks" (Wesleyan University Press), the preservationist Alan Burnham classed the Singer Building with the Woolworth, Metropolitan Life and other buildings now considered very important. By 1967, Mr. Burnham (who died in 1984) was the executive director of the new Landmarks Preservation Commission. The agency's files contain a meek request from Mr. Burnham asking U.S. Steel to consider preserving the lobby - which didn't happen. "If the building were made a landmark, we would have to find a buyer for it," Mr. Burnham told The Times, adding that "the commission doesn't have a big enough staff to be a real-estate broker for a skyscraper." There were press accounts that much of the bronze was going to be salvaged, and a few pieces do turn up in the architectural antiques trade. So then, what prompted the decision? Well, the tower portion of the Singer Building was about 65 feet square - thus the total area per floor was a little more than 4,200 square feet. The 2.1 million square feet of One Liberty Plaza is laid out on floors that measure about 37,000 square feet. So in the case of the Singer Building and One Liberty Plaza, it boiled down to a matter of square feet. And One Liberty Plaza has many more of them. Did you just post a story from January 2nd 2005 on January 1st 2005? I've attached one of the photographs (of Washington Street) below. Alternate history: What if Radio Row was saved from demolition? Would the area have become an extension of Tribeca? Would BPC even exist? You can't say, but there was a lot of talent in those shops only a short time before electonics technology exploded. Silicon (something) may have been the name of a NYC neighborhood. I'm looking forward to looking at the weblink two posts back. I recently posted this request under the Yankee Stadium thread, but either it was missed, or perhaps as I fear, the information is just too rare for anyone to reply: Does anyone have or know of any links of demolition photos of the original Yankee Stadium? I recall one in a handout from the opening 1976 season of the 'remodeled' stadium. As far as I know, the only remaining piece of the original stadium at the site is the white decorative lattice which was moved to the outfiled wall above the scoreboards and ads. An article in the print edition of the Tribeca Trib has 2 large aerial photos of Tribeca taken in 1970. I scanned, stitched, and cleaned them up, and uploaded to pbase, along with the article. The files are 650K and 1.2 meg. ...Tom Auch...BPC and WFC could not exist were it not for the destruction of Radio Row and the subsequent construction of WTC. The land West of West St was created by the excavation for the WTC.A huge pit was being dug and all the stuff taken out of it wound up dumped into the River,creating fresh real estate a few hundred feet away and birthing an urban tabula rosa that would later gift the city with the great urban space we now call Battery Park City. I worked in the Barclay-Vessey Bldg-a.k.a. "Verizon"- in the late '60s/early '70s,and I watched the transition of the area as it went from an ex-commercial zone to a big,open hole.The buildings had been torn down a long time before I got there,but the street grid was still intact,lending it an otherworldly appearance-streets serving nothing. 25th-story perch as they dug out the pit and lugged the tailings over to the Hudson,creating some new Manhattan. In the early '70s,as the bones of the new WTC towers were reaching skyward,some pioneering residents of Lower Manhattan began planting urban gardens on the bare,rock-filled appendage that jutted rudely off Manhattan's tip,like a goiter.Temporarily,it added some nascent green to the grey rock.It was a very Hippie thing to do,tending an urban garden as Collosus rose in the East,smoking joints on the new,rocky riverbank,grooving on New Jersey. I wonder if anyone who ate BPC tomatoes is still around? I wouldn't swear to it,but I'll bet what's left of Radio Row,sits at the bottom of the Hudson,it's deconstructed architecture propping up Battery Park City. Wow that's pretty interesting. But when I look that those Tribeca aerial photos from the early '70s, they look like something out of a post-apocalyptic world. But aside from that, I thought that the idea for BPC pre-dated the demolition of Radio Row.